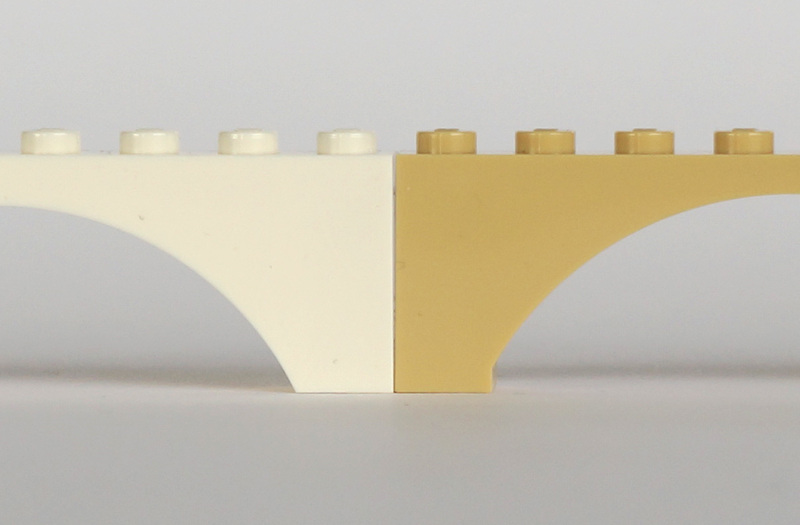 There are many reasons why LEGO® parts get redesigned, for example to strengthen a part or to improve the moulding process. But sometimes a whole 'family' of parts will get redesigned, and this process can take years for TLG to roll out because moulds need to reach the end of their working lives before the expense of replacement is undertaken. Over the last five years or so, the family of arched bricks have been altered and I was prompted to write this post because what I think/hope is the last of these, the 1X8X2 arch, has now begun to appear in its new form. The essential change to arched bricks is that they are being "raised" - the interior curve no longer sits flush to the bottom of the brick. I've mentioned in the past; one thing which really interests me is when fans push their love of LEGO® into original, unusual territory. I was simply going to post a link to these guys from New Elementary's Facebook and Twitter accounts, but I couldn't really compress my love for them into 140 characters so here's a proper post instead. The Surma Bros. are Marcin and Przemek; two Polish comic illustrators who, as the name suggests, are brothers. For two years they've been posting an illustration of an old LEGO set every Sunday on their blog, Sur m'ale Gobros. I only found them after they posted on Eurobricks recently, although I see they got some love from The Brothers Brick back in 2012. Whilst disappointed I'm so late to the party, it does mean I've been gorging myself for hours on dozens of beautiful images. A weird new part for you today, named Brick, Round 2 x 2 with 4 Petals Base on BrickLink and Plate 2X2,2/3 W/Krydshul\U0026 Crown Leaf by TLG, which so far has only been released in two 2014 Disney Princess sets in Medium Azure (Element ID 6058746 | Design ID 15469). However I've taken to calling it the Kermit, which is a really terrible name, but once the vague similarity to the collar of that Muppet had entered my mind, I couldn't shake it. 2014 has been packed full of new elements, yet all we've been doing here on New Elementary is going on about Architecture and The LEGO® Movie sets. Time to redress the balance and one particular category of 2014 elements I was very glad to see on Brickset are the ones in the lovely colour of Sand Blue.